Population ecologists study how births and deaths affect the dynamics of populations and communities, while ecosystem ecologists study how species control the flux of energy and materials through food webs and ecosystems. Although all these processes occur simultaneously in nature, the mathematical frameworks bridging the two disciplines have developed independently. Consequently, this independent development of theory has impeded the cross-fertilization of population and ecosystem ecology. Using recent developments from dynamical systems theory, this advanced undergraduate/graduate level textbook shows how to bridge the two disciplines seamlessly. The book shows how bifurcations between the solutions of models can help understand regime shifts in natural populations and ecosystems once thresholds in rates of births, deaths, consumption, competition, nutrient inputs, and decay are crossed. 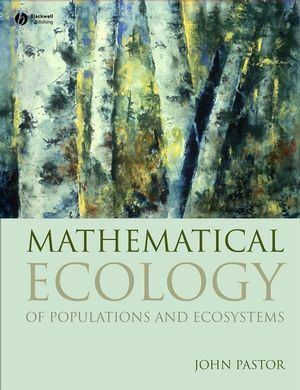 Mathematical Ecology is essential reading for students of ecology who have had a first course in calculus and linear algebra or students in mathematics wishing to learn how dynamical systems theory can be applied to ecological problems. 1. What is Mathematical Ecology and Why Should We Do It?. 3. Homogeneous Populations: Exponential and Geometric Growth and Decay. 4. Age- and Stage-structured Linear Models: Relaxing The Assumption Of Population Homogeneity. 5. Nonlinear Models of Single Populations: The Continuous Time Logistic Model. 6. Discrete Logistic Growth, Oscillations, and Chaos. 7. Harvesting and the Logistic Model. 8. Predators and their Prey. 9. Competition between Two Species, Mutualism, and Species Invasions. 10. Multispecies Community and Food Web Models. 11. Inorganic Resources, Mass Balance, Resource Uptake, and Resource Use Efficiency. 12. Litter Return, Nutrient Cycling, and Ecosystem Stability. 13. Consumer Regulation of Nutrient Cycling. 14. Stoichiometry and Linked Element Cycles. Part IV: Populations and Ecosystems in Space and Time. 15. Transitions between Populations and States in Landscapes. 16. Diffusion, Advection, the Spread of Populations and Resources, and the Emergence of Spatial Patterns. Appendix: MatLab Commands for Equilibrium and Stability Analysis of Multi-compartment Models by Solving the Jacobian and its Eigenvalues. Figures from the book are available for downloading below in a low-resolution format. You may require "Winzip" (PC) or "Stuffit Expander" (Mac) to access these files. Figures from the book are available for downloading below in a high-resolution format. You may require "Winzip" (PC) or "Stuffit Expander" (Mac) to access these files.